I was going to start this blog with the ongoing saga of culling now that deer are in the spotlight. But then I thought (yes, it happens occasionally), there's enough politics going on regarding the environment and as important as it is, I don't want this blog to get too involved and tangled up in it. This blog is about learning and sharing new experiences with you, my loyal, wonderful follower. The politics of environment can be seen everywhere and there really isn't much more I can add to it except to quote what others have said. So, I'm keeping this blog relatively politics free. So now that's out of the way, let me point you in the direction of something new on the blog. If you cast your eyes to the right, you'll see a new column titled 'Citizen Science' and here you will find a clickable list of surveys you, yes you, can get involved in. Please check it regularly as I'm often adding more to it when I find a new survey to add. I hope you like it. If you have a project or know of one that isn't listed here, please let me know, I'll be only to happy to add it. As you may be aware, wifey has now got a workshop of her own down the bottom of the garden and I've moved my office from the broom cupboard to the much larger spare bedroom. Oh the joy of being able to spread ones arms properly, bliss. So I'm now getting more settled in my spacious office and able to get on with stuff. One thing I enjoy is a bit of microscopy (looking through microscopes would you believe) and I'm often picking up dead insects, putting them in small containers so I can have a look in closer detail at a later date, much to wifey's dismay I might add. That later date has arrived and I've been looking at a dead butterfly I found in my mothers garden last year. It's a female Orange-tip butterfly Anthocharis cardamines. Butterflies and moths belong to the order of Lepidoptera, which is derived from ancient greek as "scale" & "wing", and it isn't until you look under the microscope at the wing of a butterfly or moth, that you really see what the ancient greeks were talking about. They're covered in them, the whole wing pattern is made up of, it must be thousands, of tiny little scales. Have you ever seen a butterfly bounce of your windscreen and leave behind a patch of dust? Well that dust is in fact all the little scales that adorn the butterfly. The wing of a female Orange-tip. Don't worry she didn't feel anything, she's been dead for over a year. Unfortunately, these are the best shots I can get, but you should be able to see that it is these scales the give the butterfly the patterns and colours on their wing. As you can also see, each scale is minute and held in place by an even smaller stalk called a pedicle. Every time a butterfly bumps into something, it will knock off some scales. As far as is known, this doesn't harm the butterfly but if it loses to many scales, it's flight is affected. Some mornings I've come down to the moth trap to find a moth that is so battered and worn that the majority of its scales are missing which makes ID'ing it next to impossible. Simple USB digital microscope. They're not bad for the money. It always amazes me when I see these creatures in flight, how delicate they are and yet how much control they have in their flight. Next time you see a Comma Polygonia c-album sitting on the ground, just sit and watch it. The ones I've seen seem to be quite territorial and are quick to chase off any other butterfly that invades its airspace and the ariel chase can be quite impressive. Apparently, Purple Emperor Apatura iris are so aggressive, they even chase off birds would you believe. I've never seen this butterfly, but I hope I can remedy that this year. In case you're wondering what equipment I used to photograph the scales, it's a simple USB digital microscope that plugs into your laptop/computer you can pick up on that well known auction site for about £20. For the money, they're a handy little tool that can give you an introduction to the miniature world and maybe fuel your passion to get something better. Here's one more shot I took of one of the underwings. Note the hairs, yes, butterflies have hairs as well as scales. 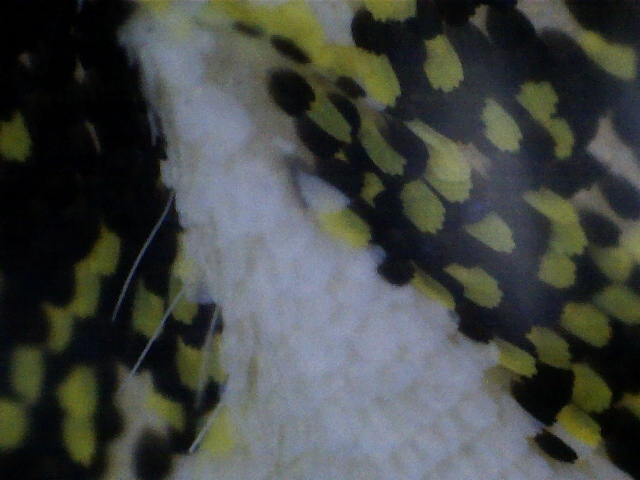 Yellow, black and white scales and some hairs too. Of course, I only use this microscope when I want to take pictures of whatever I'm looking at. In the main, I use a stereo microscope which is more suited for looking at and examining things in more detail. Stereo microscope with my little pouch of dissecting tools. 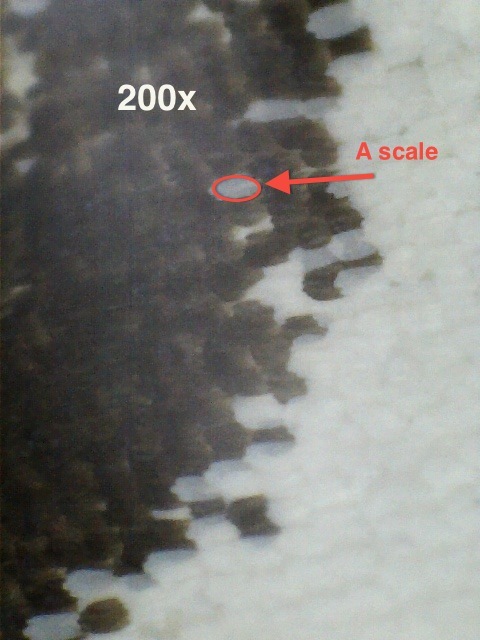 The magnification isn't any greater on it than my USB microscope and it's not all about the magnification either. Don't think you need to get the highest possible magnification you can afford, it doesn't work like that. Say you had the leg of a bee (not personally, that'd be weird) that you wanted to look in greater detail at. If you were to use a magnification of say 1000x, it would be a bit like looking at the white cliffs of Dover from 2 inches away. Yet, if you used something of about 200x, you would see the detail and structure of all the beautiful hairs along its leg and the detail of the foot. The high power stuff is ideal if you want to start looking at cells and bacteria and the like, but too powerful for anything else. My stereo microscope was a little more dearer at around £60 from that site again and although there is no name on it, I think it's a Brunel MX-6. It lights from the top or/and from underneath too, allowing you to see through some of the finer objects. And for those of you who don't have the funds for the above or just don't have the time or space for it, well you can't go much wrong with a good old hand glass. I carry mine with me everywhere and it's shown me so much that I never knew existed that I would never be without it. Sometimes, it's the simpler things in life that give the greatest pleasure. My trusty loupe, great in the field. I think that's all for now and I hope this has been of some benefit to you. For the more educated amongst you who think I might have got something wrong, please feel free to point it out to me, I won't be upset, honest. Till next time, have fun. Fascinating post. 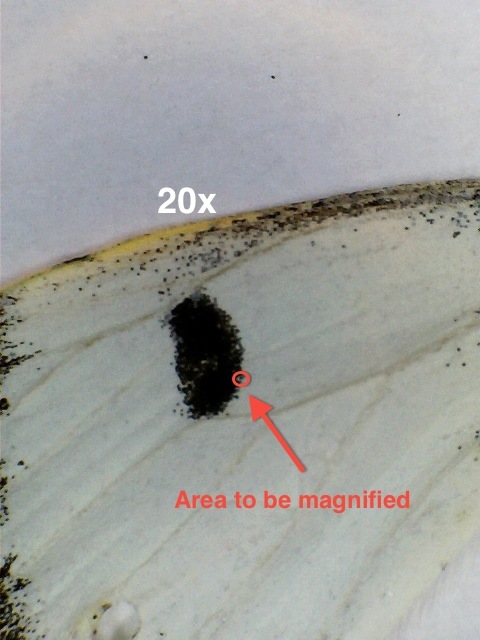 Do scales on butterflies have similar functions to feathers on birds? Glad you like the blog and what a brilliant question. I've been having a look into this and have found there to be several theories regarding Lepidoptera scales. Some sources say that the scales are to stop them (moths/butterflies) becoming trapped in spiders webs. The scales coming off easily in the web allowing the moth to escape. Another article I came across did theorise that the scales trapped dead air underneath them giving the moth lift, however, a statement further into the article (It'll be in the next blog post) made all the evidence given, sceptical. However, I did come across one paper that suggested and gave some evidence that the scales actually dampen ultrasonic waves making it harder for bats to locate them. I'll publish a link to it next time. There's also one other reason for the scales and that is camouflage, which I hope to show you all this year, how effective that camouflage can be. Hope that's answered your query for the time being. Thank you very much for your input, much appreciated.